72 in. x 18 in. x 71.5 in. 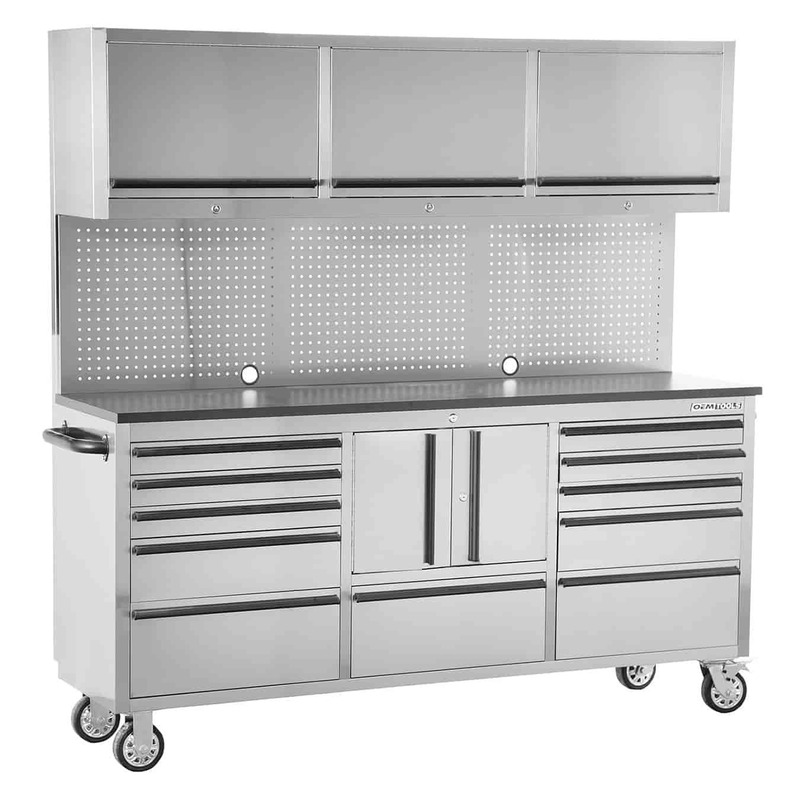 The OEMTOOLS Stainless Steel 72 Inch Cabinet and Toolbox will allow you to fulfill all of your storage needs. Aside from providing 11 premium drawers and a 2 door lower cabinet, it even includes a 18 In. tall Pegboard and Upper Cabinet measuring 18 In. x 12 In. The toolbox features Heavy duty 5 in. x 2 in. casters, internal color coded flat key locking system and pre cut drawer liners to keep tools in place. For a reliable and easy clean surface, this toolbox also features a 1 in. thick black PVC coated MDF worktop and a 430 stainless steel with anti-fingerprint finish. OEMTOOLS provides the ultimate storage solution with their toolbox and cabinet combinations. Featuring a stainless steel construction with multiple drawer and cabinet combinations to choose from, they have the right box for your needs. All units feature heavy-duty casters making them super accessible and can be relocated around the shop with ease! OEMTOOLS toolboxes and cabinets come supplied with pre-cut drawer liners and an internal color coded flat key locking system to keep your valuable investments inside safe at all times. Are the drawers on roller bearings? Yes, the drawers slides are roller bearing. This workbench weighs 380 lbs. What are the weight limits, overall and per drawer, shelf. Thank you. Each drawer is made to handle up to 100 lbs. The entire unit not including the workbench can handle 1600 lbs.